Grayson Davey, 15, started Alaska Paracord Designs when he was 11 years old. He has developed his business into a thriving lifestyle company with growth of over 400% last year and the hiring of 20+ contractors to help him make the products. He sells through his website Alaskaparacord.com, wholesale, and directly at gift shows. Grayson's products have the ability to make a fire in cold and wet conditions to signal for help in an emergency. Grayson is a sophomore at South High School in Anchorage and is a competitive Olympic trap shooter, videographer, and drone pilot. He enjoys hunting, fishing, and hiking the beautiful state of Alaska's and always wears his Alaska Survival Bracelet. 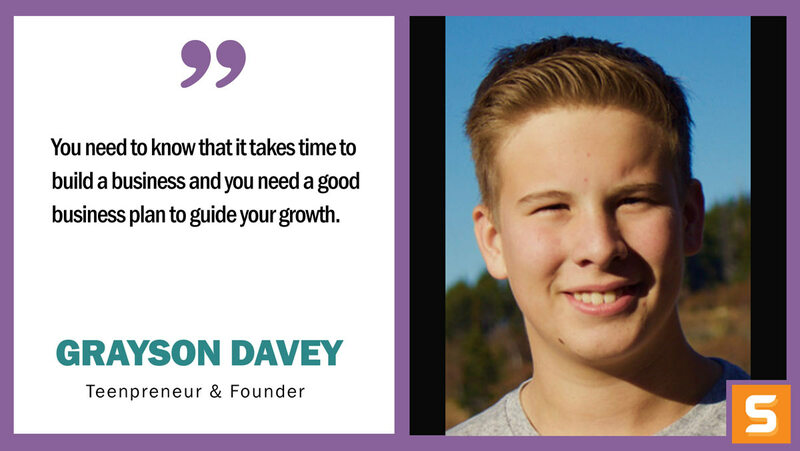 In this interview with Startup Savant, Grayson shares why he created Alaska Paracord Designs, his experience when starting a business as a kid and how he juggles school and work. Grayson also notes the importance of having a good business plan and a mentor to guide you along the way. There are a lot resources for entrepreneurs. I encourage folks to seek them out at The Board Room and participate in their events like 1Million Cups, Startup Weekend, and Launch Alaska. Can you tell us a little bit about yourself, Grayson and how you got the idea for Alaska Paracord Designs? The reason I came up with the idea for the business was when my friend, Dave, got into a boating accident on the Skwetna River with his 11 year old daughter. They were stranded on an island for 3 days without food, shelter, or anything to start a fire. When they were finally rescued, they were hypothermic and covered in bug bites. On the way back to Anchorage and the local hospital, Dave said they would have been OK if only they could have started a fire. He was afraid that he would succumb to hypothermia and leave his daughter alone. It was a scary event and shaped the way I thought about developing what you need to have on you at all times. A bracelet would stay on you and wouldn’t have been lost in the river like the rest of the survival gear. The first time I sold them was at holiday bazaar at a local high school. I sold everything I brought in a matter of a couple of hours. I worked over the winter and continued to develop the product and sold at Saturday farmer’s markets and continued to sell out every time. I am fortunate to have a family, mentors, and a community who have supported my entrepreneurship and encouraged me along the way. I participated in the Youth Entrepreneur Academy (YEA) and was paired up with a great mentor, Al Herman, a professor of entrepreneurship at the University of Alaska-Anchorage and a founder in an angel investment fund. He helped me develop my business plan, create financials, and develop a plan to expand by hiring contractors to help produce products. I implemented the business plan and continued to grow. I presented at 1Million Cups and a local reporter in the audience did an interview with me after the event and wrote an article that was picked by the Associated Press and republished around the country. A local outdoor gear store, B&J’s Commercial offered to sell my products after seeing me come in several times buying more paracord. I became Made in Alaska certified and won the Manufacturer of the Year award from the State of Alaska in 2015. The most unique thing is probably that I started this business as a kid. People are always intrigued when they see me at shows and recognize me from publicity I have received. The competitive advantage of the product is that it has a unique purpose to start a fire and additional items needed in a survival situation. Having the Made In Alaska certification has helped me gain more retailers who buy direct from me. Also, these are all handmade. No, we have never had a customer that was left disappointed. When we have had complaints, we have offered a solution and kept the customer happy and continued to improve our processes. No, the business was really easy to start and I have a mom who has run many businesses and helped with the mechanics of the business. My dad has been great at helping me engineer the product and source materials that have allowed me to sell wholesale at a rate acceptable to retailers. The time and resource constraints were challenging. I was a kid going to school and very busy. I spent the entire Christmas break filling a huge order for a retailer. I handled this by hiring other kids to contract out the assembly and freed me up to focus on growing the business. Sometimes I get tired of managing orders, school, sales, and trying to be a kid. My parents help out a lot when I get overwhelmed. Is there a type of marketing that has worked amazingly for Alaska Paracord Designs? The best kind of advertising I have found is publicity. Whenever I have an article, win an award, appearance on TV and radio interviews, my sales always increase. I also use Facebook, Instagram, website and good marketing materials. If so, how did you stumble upon it? The first article that really took off was the Alaska Dispatch article. It started off here in Anchorage and then when it hit the Associated Press and was republished around the country, we started getting hundreds of dollars a day in orders. Where do you see Alaska Paracord Designs in the next 5 years? Any new products/services in development? I want to continue to grow the business and start wholesaling to the Lower 48 states. I hope to be able to keep my production in Alaska but if it gets to be too big, I may have to move my manufacturing and give up the Made in Alaska certification. We have had requests for a dog collar version for folks who go hiking with their dogs. We haven’t developed it further than a concept. What are the three best pieces of advice that you would give to anyone starting a business in Alaska? There are a lot resources for entrepreneurs. I encourage folks to seek them out at The Board Room and participate in their events like 1Million Cups, Startup Weekend, and Launch Alaska. If you need capital to grow your business, there are many resources for angel investment and venture capital. If your product is eligible, get the Made In Alaska Certification. What do they need to know from the very beginning? You need to know that it takes time to build a business and you need a good business plan to guide your growth. If you want to learn more about Grayson and be updated on his latest moves as an entrepreneur, check him out on Linkedin, Facebook or visit his website!